So occasionally I get some jobs that are pretty cool. Bri Herman, A Female Muskie Fishing personality (many of you may already know of her) has a Facebook® community page called the Musky Huntress. With over 3.5K likes this site is no joke (since Muskie Fishing is not a broad topic). 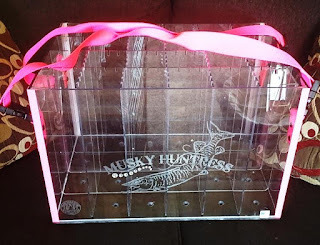 Well in a conversation with Ms. Herman we decided to make a Musky Huntress Esox Box. Complete with Pink DOT Tape and pink handle straps. The box will also be emblazoned with the Musky Huntress Logo making it unique and hopefully very popular with our Female compatriots. So be watching not only on the Team Cordwood Facebook® page but Bri's page as well!